92-year-old Lee Keum-seom exclaimed, as she fell into her long lost son’s arms at a holiday resort in North Korea Monday. Lee had been waiting 68 years for this moment, after the two became separated during the Korean War and became trapped either side of the demilitarized zone (DMZ) which now splits the two Koreas. Sang Chol was four when she last saw him. He is now 72, himself an old man. On Monday he sat waiting for Lee’s arrival with his wife and daughters, who have never known their grandmother. Theirs’ was one of multiple emotional family reunions taking place at a resort near Mount Kumgang, where buses full of South Koreans drove early Monday. 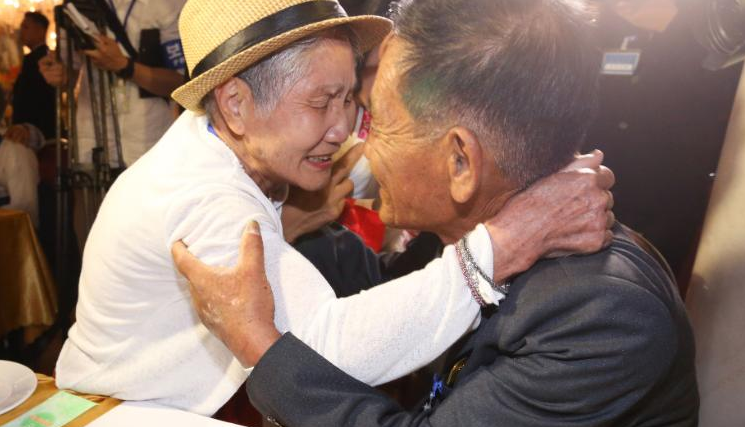 They were the 89 lucky families selected from the more than 57,000 who had applied for the reunions, agreed to under the Panmunjom Declaration signed by South Korean President Moon Jae-in and North Korean leader Kim Jong Un during an historic summit earlier this year. More than 60% of those seeking reunions are over 80 years old, and are being accompanied on the bus trip north by their children and other relatives. After the initial tearful reunion was over, Sang Chol showed his mother a photo of her husband, who had been with their son when the couple became separated but has since died. “This is a photo of my father, mom,” Sang Chol said, dissolving into sobs. Before she left for the bus trip north on Monday, Lee told CNN she had prayed for her son to have a long life so the pair could reunite. “(My family) in North Korea didn’t live long so I prayed for my son’s health,” she said. She felt nervous about meeting her now elderly son, after only knowing him as a small child, unsure about where to start catching up on a lifetime spent apart. On seeing him however, there was no hesitation, and the two elderly Koreans embraced each other tightly, both in tears. During the whole reunion, they did not let go of each others’ hands. Not Again! The VMAs Hit An All-Time Low In Viewers .